Back to School Movies, Part Deux! Kris Rasmussen is one of the smarter people and better writers in the blogosphere, but I do have some alternative choices for my Top 5 Back to School Movies list (this is her list). A great movie around the theme of school is one of the best ways parents can engage their kids in talking about what’s going on there, since the typical “how-was-school-fine-mom-what’s-for-dinner?” thing doesn’t always go too far! “Mean Girls.” Before Lindsay Lohan became, well, whatever she is now, she was known as a fine young actor and her skills showed in this one, along with Rachel McAdams and Regina George. The catty social claws that teen chicks bring out in social situations are brought directly–even painfully–to light in this well-written film where there’s at least enough comedy to make it enjoyable, yet still poignant. “Dead Poets Society.” I agree with Kris on this one, although frankly I don’t need any of it after the first 20 minutes. To hear Robin Williams’ speech and then ask anyone I’m watching it with: “What do you want to accomplish before your run is done?” is an inspiring conversation with meaning. “The Breakfast Club.” I thought it was sorta cheesy back in the 80’s when I watched it, but it stands the test of time. Everyone adult anywhere was at one time a high school student in the early stages of finding that nuanced balance between who we were and who it was we wanted to become. Watching it today, you’ve still gotta get over some of the 80’s look and vibe, but it’s worth it for the reflective watcher. “Hoosiers.” Made in the 80’s about a high school in the 50’s, rarely has a movie been about sports been so little about sports. Gene Hackman’s role as coach is representative of every authority figure a teen has to deal with, and in this one, they get it right when the main character recognizes that the tough love sent his way is real love. 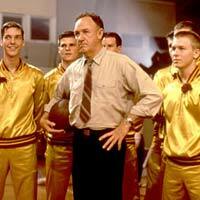 If there was an Oscar for movie endurance, “Hoosiers” would be a nominee. “Stand and Deliver.” I grew up in Southern Cal and Garfield High was just over the hill in L.A. As a suburban guy, we saw the inner-city schools as pretty much semi-unsafe and definitely unaccomplished. How wrong I was, and Mr. Escalante’s work was representative of what many, many inner-city teachers were and are doing for kids there. “Stand and Deliver” is an awesome low-budget movie that inspires any audience to higher achievement and accountability, whatever our station in life. Special Honorable Mention: “Teachers.” Would have made the list if it weren’t made in the 80’s. A great movie that takes us into the human side of teachers. Nick Nolte, Laura Dern, Morgan Freeman, Steven Hill (Law & Order), JoBeth Williams, Judd Hirsch, Ralph Macchio, and Crispin Glover (“Back to the Future”) lead the all-star cast. Rent or buy a campus movie next weekend and enjoy the inspiration, the nostalgia and–if you have kids–the purposefulness of a natural discussion about what we all have in common, both the young and the young at heart.